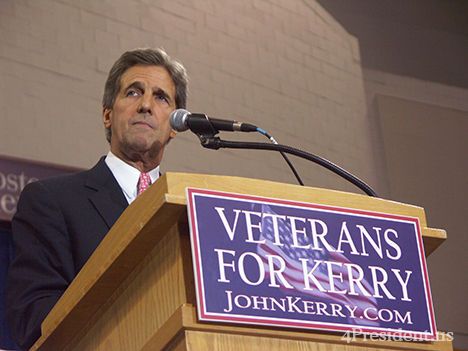 Minneapolis, MN – Democratic Presidential candidate John Kerry Friday rallied fellow veterans in Minneapolis to kick off a nationwide effort to organize 1 million veterans behind his campaign for the White House. With state Veterans for Kerry coordinators now in place in all 50 states, today’s rally marked the beginning of a grassroots push by veterans across the country to elect John Kerry President. To give something back, Kerry also announced at the rally that he is asking all his supporters to demonstrate their support for military families by contributing to the Intrepid Fallen Heroes Fund – a fund that supports military families who have lost their loved ones in battles since the attacks on US soil. Supporters can show their support by donating through the Intrepid link on Johnkerry.com. In their states, state Veterans for Kerry groups will organize and execute grassroots, veteran-to-veteran outreach efforts, including: vet-to-vet phone banks, veterans visibility efforts, veterans motorcycle rides, including one to the Convention in Boston, and Veterans Internet operations. Through their efforts, the Kerry campaign is setting the goal of organizing 1 million veterans behind John Kerry’s campaign. Kerry’s distinguished group of state coordinators is made up of veterans who served in peacetime and combat, from World War II to Iraq. Between them, they have received 17 Purple Hearts, 13 Bronze Stars, 7 Silver Stars and a Congressional Medal of Honor. From all branches of military service, the state coordinators have worked tirelessly over the past months to set up grassroots organizations in their respective states to mobilize veterans for Kerry. Before the rally, Kerry held a conference call with all his coordinators to thank them for leading the charge and for their service to his campaign. In addition to placing an Intrepid link on Johnkerry.com, Kerry will send an email to his 1 million plus online supporters asking them to give back and honor the men and women in our armed forces by donating to the Intrepid Fallen Heroes Fund. The fund helps military families who have lost a loved one make home payments, child education payments or meet similar financial needs during difficult times. As President, Kerry will keep America’s promise to our veterans. His plan includes mandatory funding for VA healthcare to properly care for over 500,000 veterans who are currently excluded from the system and revoking the Disabled Veterans Tax, which deducts disability pay from military retirement pay. Kerry is in the closing days of 11-day focus on national security, where he is talking about his plan to build a stronger, more secure America with a national security policy designed to meet today’s challenges, including modernizing the military to face new threats. Kerry continued to echo these themes at his rally today. Yesterday, Kerry announced a Senior Military Advisory Group of 10 prominent retired admirals and general officers who are advising his campaign on defense and national security issues.